But It’s Just a Joke! I can’t count the times I’ve heard “but it’s just a joke!” as an attempt to absolve any responsibility from sharing a disparaging joke. The fact is, jokes against women and/or people of color are not just a joke, but have real life consequences to the people targeted, and to those who laugh at their expense. A recent study examined the effects of sexist jokes on men, particularly their attitudes about our current gender dynamic, after reading a conversation including sexist jokes. 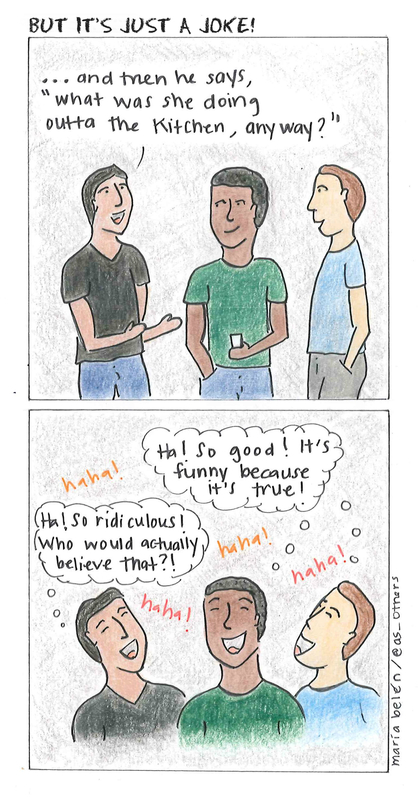 Two other groups of men read the same conversation, but with neutral, non-sexist jokes or non-humorous sexist statements. The results showed men with antagonist attitudes towards women (those agreeing to statements like “women seek to gain power by getting control over men”) report greater acceptance for the current gender dynamic (in other words, feel there’s nothing wrong with it) after reading sexist jokes than after reading a neutral joke or a sexist statement. The same lead author published a similar study in regards to anti-muslim humor. As to be expected, participants scoring high in anti-Muslim attitudes tolerated prejudice against a Muslim person more after reading an anti-Muslim joke than after reading a neutral joke or an anti-Muslim statement. Humor has the chance to reduce stress, boost our immune system, and connect us with our friends. However, it’s also a strong transmitter of prejudice, stronger than sexist/racist remarks, because it makes light of serious struggles. 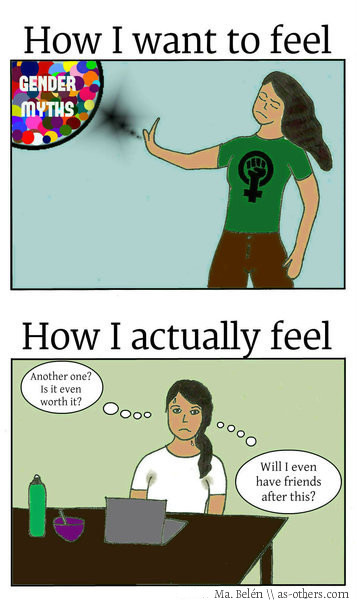 This comic speaks about the anxiety many women feel when speaking up about sexist comments, particularly on social media. The fear of having our experiences disregarded, our feelings publicly invalidated, or our criticism written away as a hormonal reaction are all possible, if not probable, scenarios when calling out sexism. The reality is that most people (on my friend’s list) wouldn’t openly invalidate my feelings on facebook because the lack of anonymity gives people a filter (it’s a whole different fear on anonymous forums). However, one does worry about the affects it’ll have on their social life. Will people still want to hang out with me? Am I still going to be invited to events? Are people going to exclude me because I “ruin their fun,” i.e. call them out for making incorrect claims or offensive comments? The mere possibility of being disregarded one more time is enough to scare people away from calling others out. I can’t imagine the effects this has on some women who want to say something, but don’t because the repercussions are too emotionally and mentally exhausting. Thankfully, I have some supportive friends. When I do call my friends out, I can be met with some condescension (“I lived with female feminist roommates, I know what it’s like to be discriminated because of my gender”) or some diminishment (“I don’t see race or gender. We are all the same”). However, I often feel heard out and respected even if they don’t exactly know how dehumanizing it is to be cat-called, or how terrifying it is to think that in some parts of the world I am my father’s or spouse’s property. At the end of the day, I can sometimes feel like the woman on the first panel but never without feeling the thought-racing anxiety of the bold woman behind the screen, if even for a split second.